Lake Biel (Bieler See) in the Jura region in the west of Switzerland, in background the Bernese Alps. A virtual guide to Helvetia, how the country was called in ancient times, but even today the name is still in use. Switzerland is a landlocked mountainous country in South Central Europe, bordered by Austria, France, Germany, Italy, and Liechtenstein. With an area of 41,285 km², the country is only slightly smaller than the Netherlands or slightly less than twice the size of the US state of New Jersey. Switzerland has a population of 8.3 million people (in 2015), capital city is Bern, largest city is Zürich. Spoken languages are German, French, Italian and Rumantsch, traditionally spoken in the different regions (cantons) of the country. According to the World Happiness Report 2015, the Swiss Confederation is officially the happiest nation on Earth. In the 13th century, the Gotthard Pass region in the heart of the Alps became negotiable and rapidly developed into an economically important north-south crossing point. 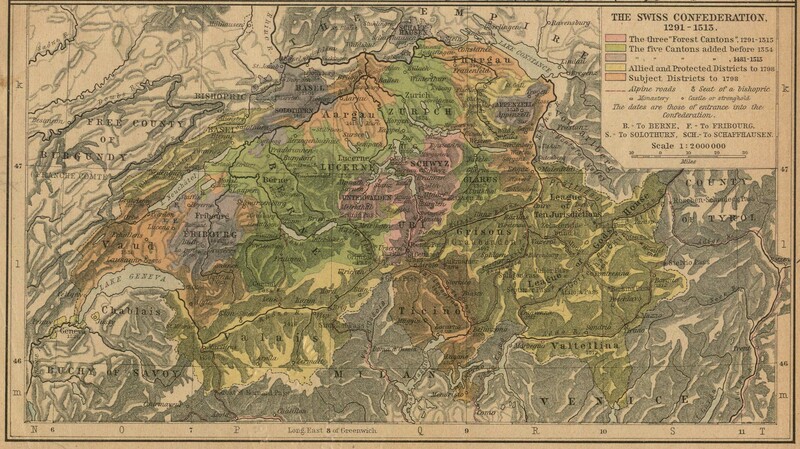 As a result, the valleys of Uri, Schwyz, and Unterwalden at the north foot of the Gotthard massif suddenly became a focal point of European power politics, and this led their inhabitants to found the core of what was to become Switzerland with a pact of mutual assistance. 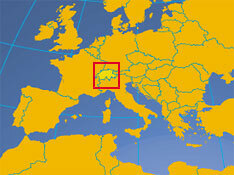 Today Switzerland is a federal state in Central Europe. It is bordered by Germany, to the north, Austria and the Principality of Liechtenstein, to the east, Italy, to the south and France, to the west. Switzerland's independence and neutrality have long been honored by the major European powers and Switzerland was not involved in either of the two World Wars. The political and economic integration of Europe over the past half century, as well as Switzerland's role in many UN and international organizations, may be rendering obsolete the country's concern for neutrality. Basel, Genève (Genf, Genève, Geneva), Luzern, Lausanne, Lugano, Zürich. Independence: The first Swiss Confederation was founded in August 1291 as a defensive alliance among three cantons (Uri, Schwyz and Unterwalden, known as Waldstätte or Urschweiz). The Swiss Confederation established independence from the Holy Roman Empire in 1499. Document of the Federal Charter. National Day (Bundesfeier/fête nationale/festa nazionale): 1. August (Celebrates the Oath of 1291, which is considered the start of the Swiss Confederation). Location: Central Europe, south of Germany, east of France and north of Italy. Terrain: 60% mountains, the remainder hills and plateau. Switzerland straddles the central ranges of the Alps. Climate: From Central European in the north to Mediterranean in the south, varying with altitude and season. Ethnic groups: Mixed European--German 65%, French 18%, Italian 10%, Romansch 1%, other. Languages: German 63.7%, French 20.4%, Italian 6.5%, Romansch 0.5%, are official languages, other 9.4%. Natural resources: Waterpower, timber, salt. Agricultural Products: Dairy, livestock, grains, fruit and vegetables, potatoes, wine. Industries: Machinery, chemicals, watch-making, textiles, precision instruments. Exports - commodities: machinery, chemicals, metals, watches, agricultural products. Switzerland is the top exporter of Gold, Base Metal Watches, and Precious Metal Watches. The Swiss Confederation, is a federal republic made up of 26 cantons (member states). Each canton has its own constitution, legislature (parliament), government and courts. The federal government of Switzerland consists of the legislative power of a bicameral Federal Assembly (parliament) with the National Council (lower house) and the Council of States (upper house). A seven-member executive Federal Council serves as the collective head of the government and the state, the judiciary power is represented by the Federal Supreme Court of Switzerland. The Federal Authorities of the Swiss Confederation, with access to the Internet Sites of the Parliament, the Chancellery and the federal Departments. Official site of Switzerland's parliament. Register of the official Internet sites of the Helvetic Administration and Public Services. www.ch.ch will guide you to Swiss administrative services at the federal level and in the cantons and communes. Federal Department of Foreign Affairs. The website introduces Switzerland's positions on important UN related issues. Address list of Swiss representations worldwide. Address list of Foreign Representations in Switzerland. Canton boundaries, Canton capitals, major cities and towns, expressways, main roads, and major airports. Searchable map and satellite view of Switzerland. Searchable map and satellite view of Switzerland's capital city. Searchable map and satellite view of Geneva. Searchable map and satellite view of Zurich. Lake Geneva (lac Léman) with Swiss Alps in background, view from the Lavaux region in the canton of Vaud. 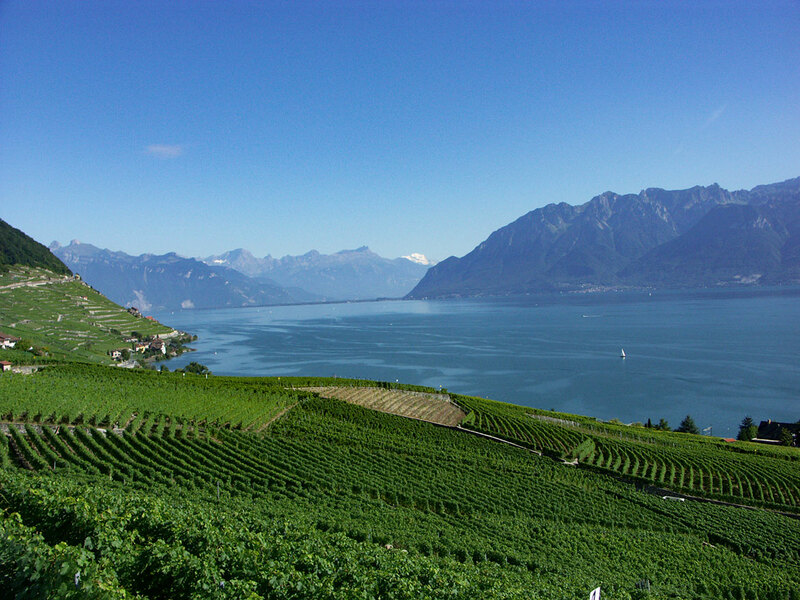 The Lavaux Vineyard Terraces are a UNESCO World Heritage Site. National and international news (in French). A leading Swiss newspaper with an international reputation (in German). National and international news in 9 languages by swissinfo an enterprise of the Swiss Broadcasting Corporation (SBC). National and international news (in French, has an English corner). A well-known Swiss weekly magazine. Dubuffet's collection of "Art Brut". Portal for art lovers and art professionals in Switzerland and around the world. History of the world's first humanitarian organisation. An interactive science museum (German). The Swiss Museum of Transport and Communication. A guide to Swiss museums (in German, French, and Italian). About the Swiss playwright and essayist. Informationen zu Leben und Werk (in German). International Festival of Jazz since 1967. A guide to popular Swiss music. Biggest open-air music event in Switzerland, includes rock, French chanson, world music, reggae, hip hop, classical music and street theatre. One of the most renowned theaters in Switzerland. Switzerland is a prosperous, and modern market economy with low unemployment, a highly skilled labor force, and its GDP per capita is among the highest in the world. The country's economy benefits from a highly developed service sector, led by financial services, and a manufacturing industry that specializes in high-technology, and knowledge-based production. Central Bank of Switzerland. The Swiss National Bank conducts Switzerland’s monetary policy as an independent central bank. Chambers of commerce and industry of Switzerland. On the website you will find all the relevant details and contact information of the cantonal Chambers of Commerce and Industry that are part of the network. Henry Dunant's dream come true in 1866, the foundation of the Red Cross in Switzerland. The master of watchmaking since 1875. Ultra-luxury Swiss watches made in Le Brassus. Swiss watchmaker based in Grenchen. All the Swiss watch makers. Chronometer - Invenit et Fecit. High-end Swiss watch manufacture based in La Chaux-de-Fonds. Luxury watch company based in Saint-Imier. Swiss luxury watchmaker based in Biel/Bienne. Swiss luxury watchmaker based in Geneva. Modern times Swiss watches for collectors. The Wonderful World of Swiss Watches. Swiss luxury watch company based in Geneva. The leisure airline serves various destinations in the Mediterranean, in the Caribbean, Brazil, Mexico, Canada, and the Maldives. Focuses on non-stop flights from Zurich to attractive destinations in Southern Europe. The Swiss Flag Carrier - its site provides intercontinental flights schedules, time tables, special offers and frequent flyer program. EuroAirport is one of the few airports in the world operated jointly by two countries, France and Switzerland. Official website of Geneva Cointrin International Airport. Official website of Switzerland's principal airport. The Matterhorn Gotthard train runs from Zermatt to Göschenen. Along its way the train overcomes a total of 3300 m difference in altitude. Famous Swiss mountain railways from St.Moritz to Zermatt and the slowest express train in the world. The Gornergrat Bahn takes you from Zermatt up the 3089 m high Gornergrat. Arosa Railway, Bernina Express and other railways. 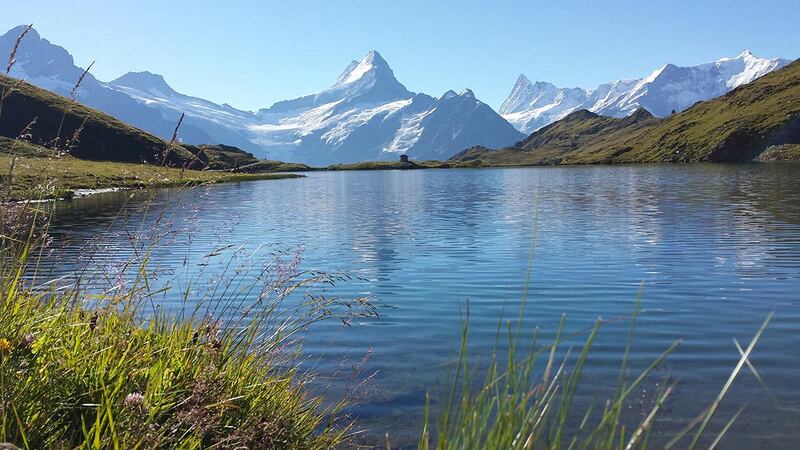 Bachalpsee (lake) and Schreckhorn mountain (center 4,078 m (13,379 ft)) in the Bernese Alps near the town of Grindelwald in the Canton of Bern. Discover Switzerland: St. Moritz, Davos, Lausanne, Zermatt, Lugano, Geneva, the Matterhorn, the Swiss cantons. Find hotel, accommodation, attractions, festivals, events, tourist boards, the alps, wellness, health resorts and spas skiing, climbing, tours and much more by following the links below. Information for the travel destination Switzerland. Switzerland's official portal. Comprehensive information about Switzerland in its diversity: geography, economy, science, people, culture, government and history. 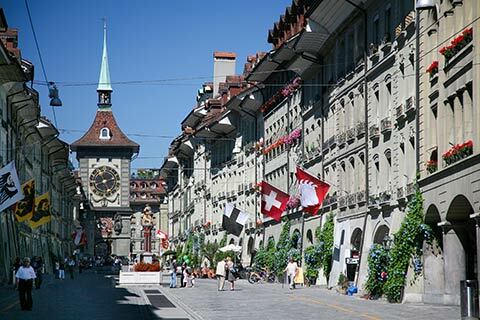 Commercial Swiss portal with extensive travel and tourism information. 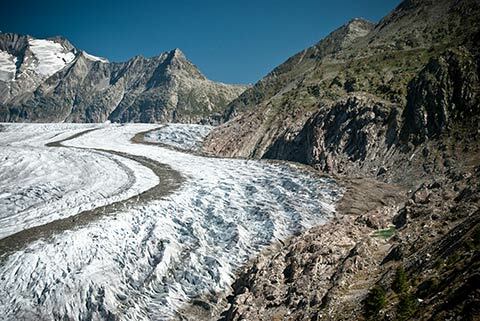 Tourism guide to the largest and easternmost canton of Switzerland. Travel and tourism in the Grindelwald region. Official website of Jura Tourism. 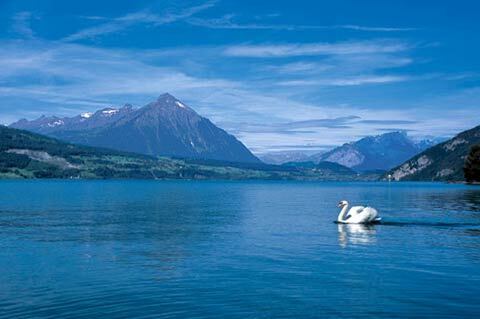 The Lake Geneva Region offers Alpine panorama and an almost Mediterranean climate. The official tourist guide for the Pearl of the "Swiss Riviera". Official tourism website of the canton Neuchâtel. Official website of Jura & Three-Lakes. Official tourism guide of Ticino canton in the southernmost corner of Switzerland. Tourism in the canton at Lake of Constance. Hotels have their anecdotes, grand hotels sometimes a history, but only certain palatial establishments can claim to embody a legend. Lake Thun, the Alpine lake in the Bernese Oberland. The University of Basel (in German). University of Geneva, founded in 1559. Foundation of the Academy in 1537. University of Zurich, founded in 1833. FOEN is the federal government's centre of environmental expertise. Pro Natura is a private non-profit organization founded in 1909. It's the largest conservation organization in Switzerland. Outline of the history of Switzerland and links to additional information about Swiss history.